The Wanganui Boys Under 15 team with their gold medals after winning the National Championship in Dunedin on Saturday. The Wanganui Under 15 boys team have done their bit to make Hockey New Zealand reconsider the strategy review which will do away with the Central Region, after they went back-to-back to win the National Championship in Dunedin on Saturday. 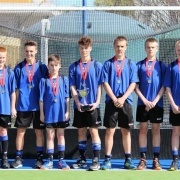 Played in the shadow of Hockey NZ considering reducing their regions from six to eight so they can align with high performance centres, Wanganui dominated the tournament, scoring 46 goals and conceeding only eight. Other than what coach Robbie Matthews called the "reality check" of the 3-3 draw with North Harbour B in their last pool match, Wanganui won all their other matches by comfortable margins, including the final 4-2 over a game South Canterbury. Wanganui had gone out to a 4-0 lead by the 45th minute, and although South Canterbury pulled their goalie for an extra attacker and managed to pull it back with quick-fire goals in the 57th and 58th minutes, the favourites then shut them down to finish the match out. "We were able to give our subs a bit of a run," said Matthews. "It was quite messy towards the end. So we put our front liners back on." Playing a fellow country team with a similar "nuggety attitude", Wanganui picked up three green cards around that 50th-60th minute period, but South Canterbury lost Dougal Gibson to a yellow card for a late tackle in the 54th minute, just when they went without a goalie. "It was a pretty cool finish, big ups to the boys, they deserved to win," said Matthews. "A couple of goals put the pressure on [South Canterbury]." Charnce Tangiiau and Connor Managh scored field goals in the 13th and 18th minute to set the tone, and then in the second half Ben Havord converted a penalty corner in the 43rd minute with a Ryan Bayler field goal following two minutes later sealed the deal. Blake Hoskin (nine) and Charlie Sutton (eight) didn't get to add to their impressive goal tallies, while the hard-working Finnegan Murphy was named team MVP. 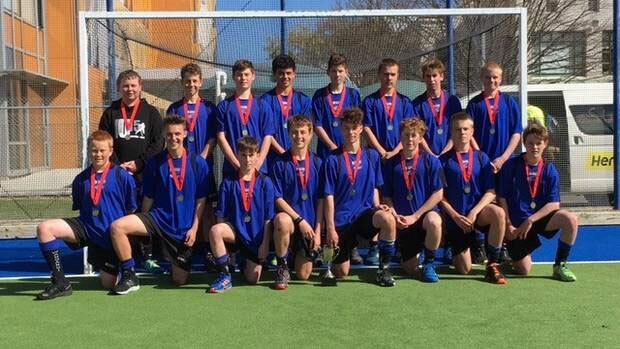 Matthews had been involved with the 2017 team under coach Andrew Spence that finally won the U15 Championship after years of coming close, which was accomplished on the back of rock-solid defence by not giving up a single goal. However, the 2018 played with speed and skill, with Matthews comparing their passing abilities to the same level of her Central age group teams who have played in the NHL. "It's been one of the most exciting teams I've had the chance to work with." As Hockey Wanganui chief executive, Matthews has been given dates for the 2019 National Championships, but all eyes are on November where the Hockey NZ decision on the fate of both Central and the Northland associations will be made. As well as Wanganui's success, Northland finished third at the National Premiers boys competition in Christchurch, while home town team Hawke's Bay came third at the Premier girls tournament in Napier. Matthews said the Under 15 teams success means the Wanganui Under 18's are looking strong, while Central age group teams and players have also been making their presence felt on the national scene. "The results the Central region teams are getting, people are starting to think, 'what are [Hockey NZ] doing'?" Unfortunately, Canterbury B continues to be the thorn in the side of the Wanganui Under 15 girls team, beating them 2-0 in the National Championship final in Carterton, which made it a provincial double as Canterbury A won the Premier tournament in Napier. Abby Mason in the 19th minute and Niamh McKenzie 32nd minute got the goals for the champions, who also picked up two green cards, as did Wanganui. "The girls played really well, but we lost," said coach Jan Dixon. "A shot hit the post, and stuff like that. "It was a pretty good team effort." Skipper and team MVP Olivia Smith just missed a shot, while Charlotte Baker was the one to hit the post. Margy Hazelhurst worked hard, just as she had all tournament, while Nicole Parata and striker Jane Abraham had good games. CONGRATS to the seven WHS students; L-R: Blake Hoskin, Charnce Tangiiau, Ben Skedgwell, Nathan Cohen, Max Burrack, Angus Dalgleish & Ryan Bayler.